Terence Crawford who will face Jose Benavidez Jr. Saturday in his home in Omaha, Nebraska, says he wants to fight the other welterweight champions, but he was not referring to Manny Pacquiao. In the past, Crawford was aiming at a Pacquiao fight. It was the time when Pacquiao was on his heyday and Crawford could earn a lofty pay. Pacquiao’s former trainer Freddie Roach, did not want Pacquiao (60-7-2, 39 KOs) to face Crawford (33-0, 24 KOs), who appears to be a dangerous foe for the boxer turned legislator and considered as one of boxing’s elite. 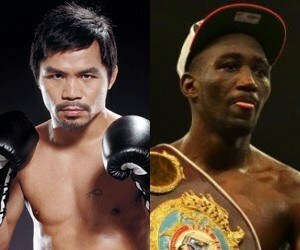 Crawford does not consider Pacquiao a champion because "he don’t have the super belt." Crawford added that he "don’t look at the WBC silver and the interim belts and all that." For the WBA, Keith Thurman (28-0-0, 22 KOs, 1 NC) is the “super” welterweight champion. The WBC champion is Shawn Porter (29–2–1, 17 KOs). The IBF champion is Errol Spence Jr. (24–0–0, 21 KOs). Crawford now holds the WBO welterweight title belt which Pacquiao lost to Jeff Horn in July 2017 in Brisbane, Australia. The 31-year-old Crawford grabbed his third division crown from Horn (18-1-1, 12 KOs) last June 9 at MGM Grand Garden Arena in Las Vegas. Benavidez was an eleven time national champion, which include the Silver Gloves twice, qualifying for the Junior Olympics and earning a spot on the U.S. National Team. He had an impressive 120-5 amateur record. He is also the 2009 National Golden Gloves Champion in the light welterweight division, the youngest ever Golden Gloves Champion at only sixteen years old. Benavidez was born in Panorama City, California and has now 27 wins, 18 by KO with no loss or draw. The Los Angeles Lakers will play again with the Golden State Warriors today at Las Vegas. Last Wednesday, the Lakers vanquished the Warriors, 123-113, in their first meeting in the preseason. The Lakers, now 2-3 in the preseason, got some nice plays from LeBron James, who contributed 15 points, 10 rebounds and 5 assists in just 17 minutes. But it was Brandon Ingram who led Los Angeles with 26 points, 5 rebounds, an assist and steal in 26 minutes. He shot 15 of 17 from the charity stripe. Kentavious Caldwell-Pope in 23 minutes chipped in 20 points with 3-of-6 in the 3-point area. For Golden State Stephen Curry had 23 points, while Kevin Durant finished with 18 points and 12 rebounds and Klay Thompson made 20 points. The Warriors are now 1-3 in the preseason. Draymund Green was not able to play but is exoected to suit up for the Warriors in the second game today. Manny Pacquiao had signed with Floyd Mayweather longtime adviser, Al Haymon and it was a bold move towards the realization of a Mayweather-Pacquiao rematch. Top Rank CEO Bob Arum reacted to it. "I don't want any part of it. They're past their prime. It'll do good at the box office. It'll make money, which is fine. But, they're not elite fighters anymore," Bob Arum told TMZ Sports. "It's a money grab. Business is business. It's good money for each of them. You can't begrudge them, but they're not elite anymore." The Mayweather-Pacquiao fight was televised through pay-per-view (PPV) jointly by HBO and Showtime. In the Philippines, the fight was shown in all the three major television networks ABS-CBN, GMA, and TV5. The fight was expected to make 4.4 million PPV buys and it broke revenue records in the U.S. with $410 million, making it the highest-grossing PPV in history. The figure had reached to 4.6 million PPV sales. The fight was watched by nearly half of the Philippines' households.